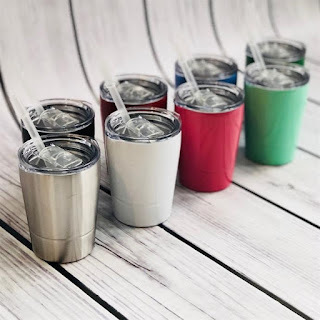 Check out these Mini Stainless Steel Insulated Tumblers $8.99 (Retail $15). This adorable mini insulated tumbler is perfect for your everyday juice, coffee, tea, or wine cup. It is great on the go and holds 8 ounces of hot or cold beverages. Includes lid with sliding closure as well as a red straw. Tumbler is hand wash only and lid/straw are top rack dishwasher safe. $2.99 for the first item and $1.99 for each additional item. US only. Seller usually ships within 5 business days. Ships no later than Fri, Jul 20.